There’s usually a debate among writing experts about the pros and cons of outlining a novel, before you actually start the writing process. I firmly believe in outlining when you’re planning to write a story longer than flash fiction or a relatively short story. I think it helps to plan for what your characters will be doing, and where your story will be going once you begin. Think of outlining like building a framework or a model with cardboard and paper, before doing it with bricks and mortar. Outlining involves pre-planning the novel, and making notes on major elements of the story like the plot, theme, setting and characters. It can involve writing it out by scenes or chapters, breaking down the plot into smaller bits from beginning to end, following a character’s journey, and so on. The process of outlining starts with brainstorming and then scribbling down ideas in a well-organized manner. While you’re still working out the ideas for your novel, it is important to write down everything that comes to you. Doing an in depth character analysis, setting scenarios and planning a detailed plot often proves to be very helpful once you actually begin the writing process. Outlining can be done on paper, on a Word document or even using software like Scrivener. 1) Having an outline gets you prepared and familiar with the ideas you’ll be writing. When you know what you’re writing, you’re more likely to manage your time better. You won’t have to worry about where the story is going, or what scene to write next when you get to your desk. 2) You have a sense of direction, when you’re working with an outline. When you have an end-goal in mind, it’s easier to guide your plot and characters to the finish line. You’re prepared for what will happen next, as you go along. 3) You won’t write yourself into a corner. When you’ve got a well-planned outline, there’s little chance of you getting stuck with a plot twist wondering what to do. Outlining familiarizes you with every event that can emerge, letting you develop all possible plot tensions. Every writer knows the importance of plot tensions that make the reader completely involved in the story and anticipate the proceedings. Formation of a detailed and well composed plot sketch includes outlining of theme, subplot, tensions and conflicts, climax and resolution. This type of integrated plot planning helps to weave the story successfully into the novel. 4) Outlining helps you avoid writer’s block. Creative people often work well when they are highly inspired and are in creative mood. Outlining ensures you know where you are going, so the odds of getting stuck creatively are less. You are able to build momentum and not lose it if you already have a plan for the next two or three steps ahead. 5) Outlining helps you recognize foreshadowing opportunities, and weave them into the story at earlier points. You can’t foreshadow coming events if you don’t already have them in mind when you were creating your outline. When you’re writing to an outline, there will be points at which you naturally pick up on foreshadowing opportunities. 6) You’re more likely to get story structure correct the first time. Without an outline, you’ll probably need to go back and do a whole lot of rearranging of material to get the story structure right. Outlining helps you to stick to your storyline and arrange events and happenings in a coherent and effective way. 7) You’re likely to have an easier time when doing edits and revisions, if you write with an outline, than if you didn’t. Of course, when creating a first or second draft, the editing process takes time, but if you had an outline, there should be less confusion regarding the flow and structure of the story, saving you time and days of endless frustration with your manuscript. 8) Outlining also helps with character development. Creating the perfect characters for your story requires a lot of planning and backstory. Along with naming them, you need to build everything about them, including their physical appearance, personality traits, backgrounds, occupation and education. Still your character isn’t complete yet, adding their motivations, their internal and external conflicts is what brings life to them and make your story life like. Outlining the complete outer and inner self of your character will help you make them real and relatable to the reader. 9) It helps you research. Having an outline will alert you to the areas of your story you’ll need to do some research. Even if you’re ‘writing what you know,’ there may be a few details or facts you’ll need to check. Better to do this ahead of time than have to go back through your manuscript later. Aristotle believed that a good story must have three main events: an inciting incident, climax or a crisis and a resolution. These three steps are the most crucial ones and for some writers, outlining them is enough to kick start their writing. 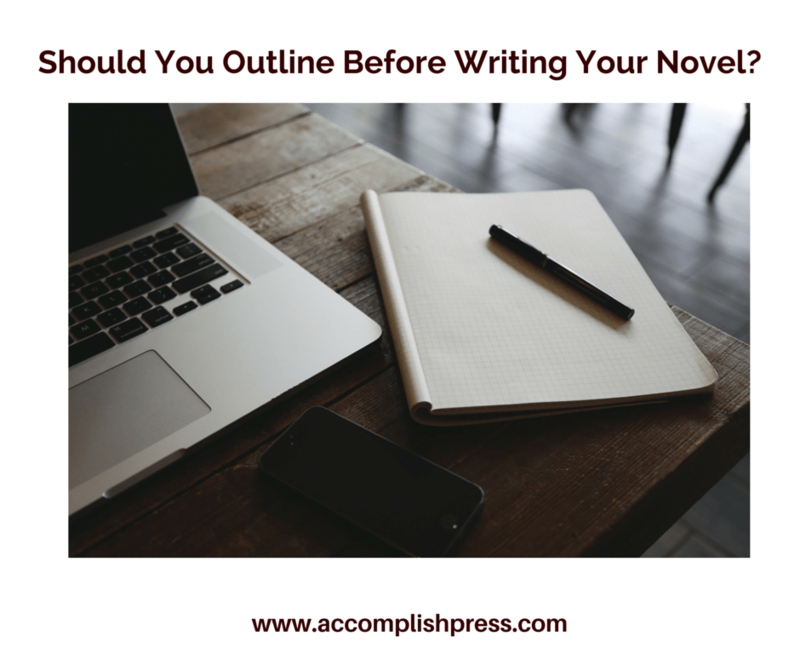 Of course, it is important to note that there is no “right” way to write a novel, and there are many writers who believe that they don’t need an outline before they start to write. Some writers believe in letting their subconscious do the writing without having a set structure that stifles them. Whether you choose to outline or not, it’s totally up to you. There are no rules saying that you must adhere strictly to your outline when you start writing. It’s supposed to act as a guide. While writing, you might feel like changing some events, introducing a new character, or even creating a new sub-plot. When that happens, you may decide to review and amend your outline. However, I still recommend outlining because it keeps you prepared for the writing task. If you can write an outline of about five thousand words, you’ll be able to resolve at least some of the dead ends, plot holes, and inconsistencies in motivation that your story might contain. Personally, I think the benefits of outlining your novel makes it worth doing. I sometimes have an outline, even for my flash fiction stories, though I don’t usually write them down. What do you think? Do you outline or not? Are you likely to outline your next book? Let’s discuss in the comments. I don’t always tend to use an outline. Mainly, because I often get new ideas while writing and my plot takes different turns. I will sometimes write down some ideas. However, most of the time it is purely imagination that leads.